I’ve always felt that knowing a few quirky facts about the place you are going or have been too adds to your travel experience conversations. After all, let’s face it, most of us are envious when we know someone that has booked a trip, particularly to places deemed exotic. No matter what shade of green you don for your envy attire, it won’t match the iridescent glimmer of New Zealand’s landscapes. You might as well add this charming country to your bucket list and throw your green ensemble away. You won’t need it. You’ll be living it. But, I digress. I was distracted thinking about the overpowering beauty of New Zealand. About a third of the country is comprised of protected national parks. What I meant to share was my taste for kiwi fruit, granted a subtler shade of green but nonetheless delightful. Years ago, when I was in Australia, my hosts introduced me to pavlova, a meringue-like dessert, in this case, layered with finely sliced kiwi on top. I’ve always been a fan of this fruit, but it is not native to New Zealand as many think it is. It is named after New Zealand’s kiwi bird, but its origins hail from China. You’ll find this luscious, succulently sweet fruit in New Zealand’s fusion cuisine. I’m also a huge flick fan. I cherish a good film. And I loved Lord of the Rings. Suspect you know where I’m going with this. All but one scene of the Lord of the Rings films was shot in New Zealand. The marketing side of me says that you’ve basically got a 12-hour long infomercial for the country’s landscapes, i.e. Middle Earth. Officially home to the Lord of Rings movies, New Zealand broadcast the first weather report in Elvish language in 2012. When you arrive in Auckland, don’t be alarmed by the number of volcanic cones. There are 50 of them, but most are extinct. You can see Mount Rangitoto from the harbor. It’s the most prominent. White c apped mountaintops. Lots of them. When you travel with Sunny Reynolds of Biotrek Adventure Travels to New Zealand, Fox Glacier is a stopping place. New Zealand is the third closest country to Antarctica, only after Chile and Argentina. I grew up in Portland, Oregon. Really like living in a postcard with the views of Mt. Hood and Mt. Rainier as a backdrop. An hour gets you to the mountains and an hour west gets you to the Pacific Ocean. Sand in my toes, salty wind in my hair, screeching seagulls and the ocean with its ever-changing moods. These are the ingredients for my nirvana, so yet another notch for New Zealand. No matter where you are in this country, you’ll never be more than 80 miles from the seaside. My kind of big water connection. New Zealand may look like a small country on the map but it has the 9th longest coastline in the world, with a length of 9,400 miles. While I doubt that you would want to pay the extra baggage fee to bring your golf clubs and your travel itinerary may not include an 18-hole detour, there are more than 400 golf courses, more per capita than anywhere else in the world. What’s that musical, ‘on a clear day you can see forever.’ Sacred to the local Maori, New Zealand’s Blue Lake is the clearest lake in the world with visibility up to 80 meters deep. That’s roughly 262 feet. I’m also an advocate for taking big leaps…not like jumping out of a plane without a parachute…not a death wish…but calculated risks are fine. Like risks that entrepreneurs take on a regular basis. One such enterprising New Zealand fellow is Alan John, “A.J.” Hackett who spent a brief time in jail in 1987 for a jump off the Eiffel Tower. But he sprang back and in 1988 created a site on the Kawarau George Suspension Bridge in Queenstown noted as the world’s first commercial public bungy. 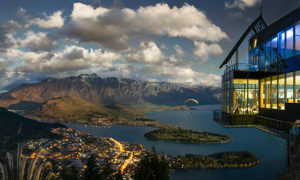 He is also given credit for launching New Zealand’s adventure tourism industry. In 2017, as part of the Queen’s Birthday Honours, he was appointed an Officer of the New Zealand Order of Merit for services to adventure tourism. Way to go A.J. Oh, to be inspired. Hackett has a list of daring jumps to his credit. His idea for “bungee” came from cultural jumps performed in Vanuatu where their idea of safety is tree vines tied to their feet. I’ve done the walk between trees deal hanging on to a rope rail but jumping from a bridge with springy cords. Not sure. 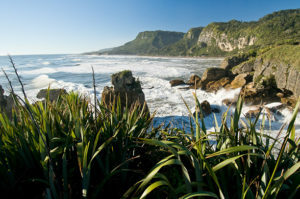 What I am sure about is the allure of New Zealand destinations, places like Waiheke Island, Waitomo Caves, Rotorua, Abel Tasman National Park, Punakaiki, Dart River Wilderness Safari, and Milford. Really, there are no bad itineraries. The range of scenery is breathtaking whether you are walking in a rain forest or hiking a mountain or visiting a glacier or beach combing. I’m an adventure advocate. I like going places, seeing new things, taking the road less traveled, all that high energy, high enthusiasm stuff, the stuff of stories. The stuff you write about and share. And travel trivia, I like that too.